A new character trailer and poster have been released for The Secret Life of Pets 2 focusing on Snowball. 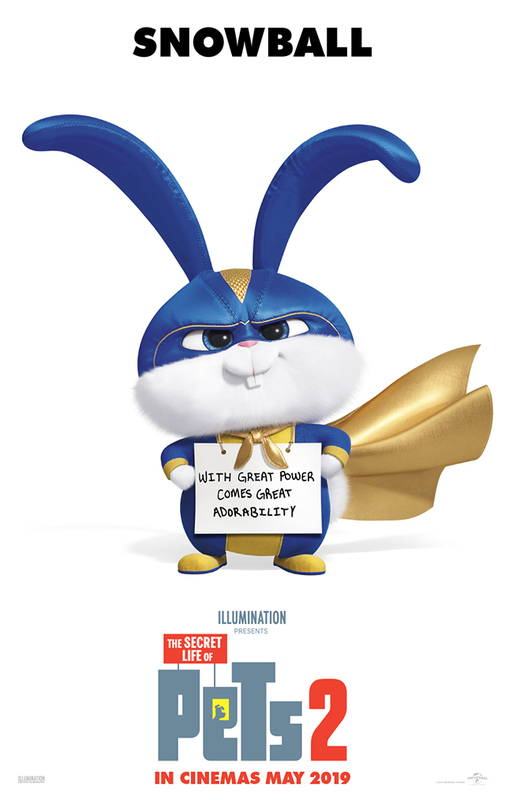 The cute white rabbit, voiced by comedian Kevin Hart in the film, is seen suiting up into a superhero costume in the trailer. It quickly transpires that it’s his owner Molly that’s dressing him up though. Once in his costume, Snowball dives onto the balcony of the apartment he lives in and does his best superhero impressions. The noise he makes attracts the attention of Max (Patton Oswalt), the dog that lives upstairs. Snowball is then seen back in Molly’s bedroom where he’s given the task of running a superhero meeting. The other attendees are the little girl’s teddy bears dressed up. It will arrive in cinemas on 27th May 2019.